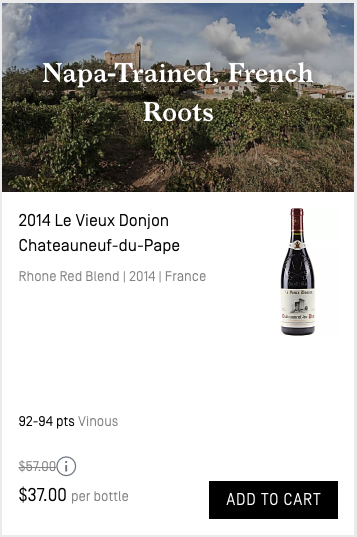 Wine Access has the 2014 Le Vieux Donjon Chateauneuf-du-Pape for $37/btl with free shipping on $125+ orders. 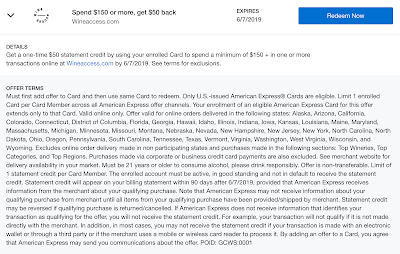 Stack it with the currently active $50 off $150 Amex Offer for Wine Access. If you have this, 5 bottles would be $185 - $50 = $135 which is $27/btl. This is an amazing price for a reliably outstanding Chateauneuf-du-Pape that retails for $59. Wine Spectator rated this vintage 91 poitns. 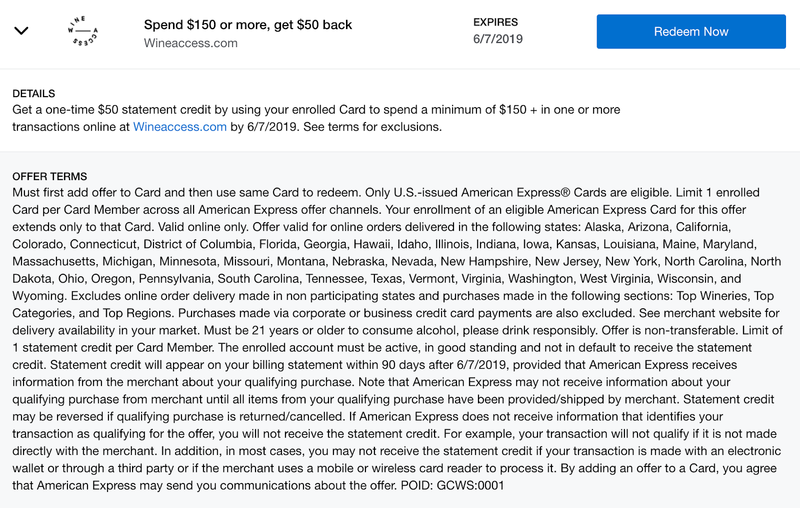 Amex is back with another $10 off $50 offer for Wine.com. This one expires 7/31/2019. It's targeted but seems widely available. 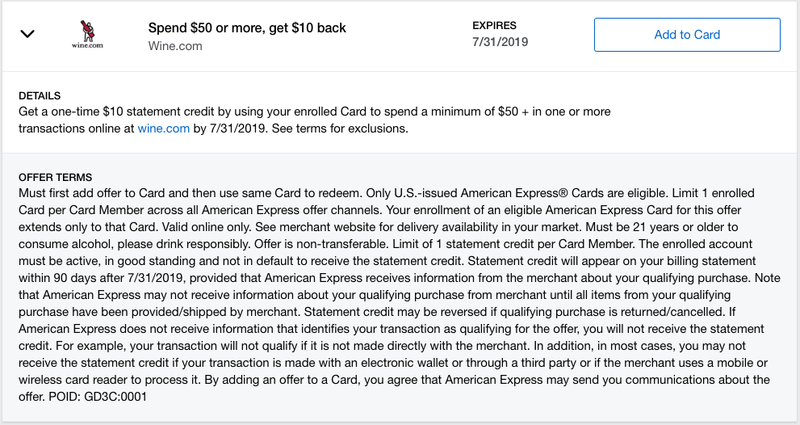 Amex now limits their offers to one per social security number regardless of how many cards you might have with them. If you have a few authorized users on your cards it can be a nice way to gather gift cards at 20% off to later combine in a single order. Stack it with a shopping portal at the time of purchase, a promo code, and Stewardship and it can mean discounts close to 50%. 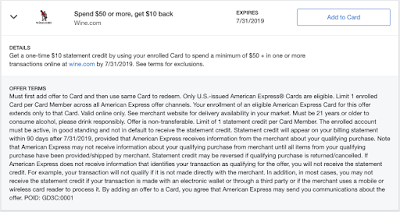 For now, head on over to your Amex account and add the offer to your favorite Amex card. Then purchase gift cards from Wine.com for later use. I first tasted EnRoute Pinot Noir at a tasting that was aimed at shining a spotlight on various single vineyard Napa Cabs from Nickel & Nickel. After that tasting, I sought out EnRoute Pinot Noir and discovered something interesting. Although it carries a release price of $60/btl it can be had for much lesss on the east coast. 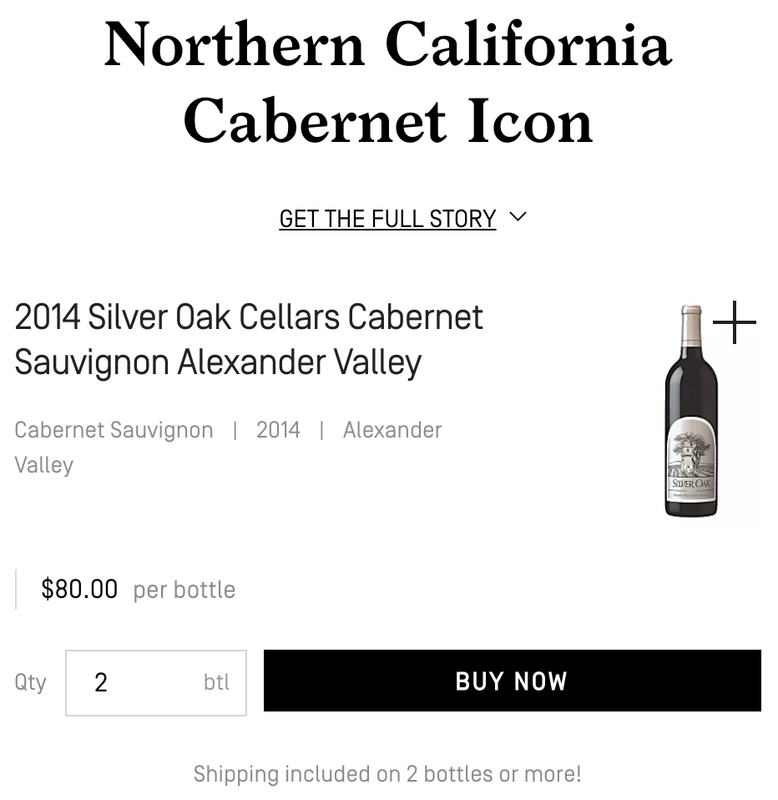 As of this writing, Total Wine has it for $39.97 and Wine.com has it for $44.99. Keep in mind, no tax on wine in Massachusetts. And there are regularly ways to buy from Wine.com at deep discount through Amex Offers, discounted gift cards, and by shopping through a portal. The net of it is you can buy this wine for less than $30/btl if you've got the patience for navigating deals. This pricing condition has been in place for some time and while it last I'm a buyer, and I'd encourage you to be as well. Medium bodied visually for California Pinot Noir with an absolutely gorgeous nose of perfectly ripened strawberries, dusty bramble berries, and a hint of baking spices. Absolutely spot on. The mouth-feel (silky verging on velvet) and transition from the aromatic experience to the palate is seamless. Satisfying body with just a touch of tannic grip compounds with blackberry flavors on its way to a lingering finish. I've found this wine to be reliable outstanding in the range of 92-95 points across a number of vintages and it's firmly in my rotation year in and year out. Although their parent company Nickel & Nickel focuses on Napa Cab they clearly have a skillful hand with Pinot Noir. This wine is absolutely (and reliably) delicious and I would offer it up as a textbook example of why I love California Pinot Noir. I'd love to hear your thoughts on it if you have a chance to check it out. So, 2 bottles would be $160 with free shipping. Knock $50 off that with the Amex Offer and that's $110 for 2 bottles. Or $55/btl.